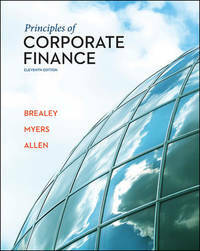 Principles of Corporate Finance, 11th ed. Paperback. NEW. BRAND NEW, Well Packed, Usually ships in 1-2 business days Expedited shipping within US, Canada, UK, and other EU countries will arrive in 3-5 days [Black & White or colour international edition The international edition will has different ISBN and cover design from us edition Occasionally, international textbooks may come with different exercises at the end of chapters Restricted sales disclaimer wordings, may or may not contain access codes or CD] Buy with confidence Excellent Quality, Service 100% Customer satisfaction guaranteed! Mc Graw Hill India, 2014. Paperback. New. Brand New Please Read Notes: Brand New, International Softcover Edition, Printed in black and white pages, minor self wear on the cover or pages, Sale restriction may be printed on the book, but Book name, contents, and author are exactly same as Hardcover Edition. Fast delivery through DHL/FedEx express. by Richard A Brealey (Author), et al. McGraw-Hill Education. Hardcover. 0078034760 US Edition Textbook, May Have Highlights, Notes and/or Underlining, BOOK ONLY-NO ACCESS CODE, NO CD, Ships with Emailed Tracking from USA . Good. 100% BRAND NEW ORIGINAL US HARDCOVER STUDENT 11th Edition / Mint condition / Never been read / ISBN-13: 978-0078034763 / Shipped out in one business day with free tracking.